Advanced Driver Assistance Systems (ADAS) Quick Link: Have you seen vehicle features like adaptive cruise control, parking assist sensors and blind spot indicators? All of these technologies (and many more) fall into the new category of vehicle systems known as ADAS — Advanced Driver Assistance Systems. If you haven’t encountered ADAS yet, you will soon, as the latest generation of vehicles makes its way into the aftermarket for service and repair. 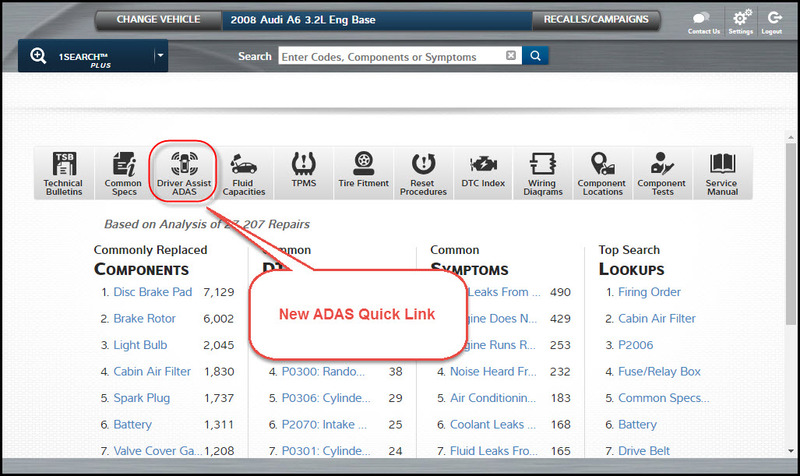 ProDemand streamlines your lookup process for ADAS features by consolidating the information you need to understand for a diagnoses and repair. Simply select a vehicle, click the ADAS Quick Link button and get immediate access to a table listing of all the ADAS features for the vehicle and the specific components involved in providing those ADAS features. 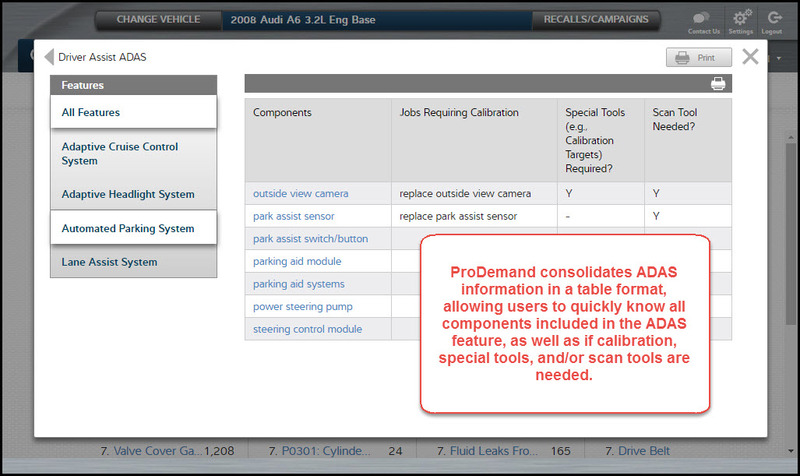 ProDemand prevents overlooking or missing work by letting service writers and technicians know if the components of an ADAS feature will require calibration, special tools or scan tools in order to complete the job. The table format combines all the ADAS information for the vehicle, allowing you to understand the full extent of the ADAS feature at hand, as opposed to performing multiple lookups to find each piece of information separately. The listed components are links that will direct you to the 1Search Plus card results as if you had typed in a search for that component. Extended Maintenance Mileage Intervals: With a reasonable expectation that a newly purchased vehicle will make it to 200,000 miles, regularly performing maintenance services is a critical factor in keeping those vehicles on the road. You may have noticed that OEMs generally do not provide maintenance information past 100,000 to 125,000 miles. ProDemand now contains updated maintenance mileage information for vehicles all the way to 300,000 miles. For this update, we’ve added information for Toyota, Lexus, Scion, Buick, Cadillac, Chevrolet, GMC, Hummer and Oldsmobile with other OEMs soon to follow. 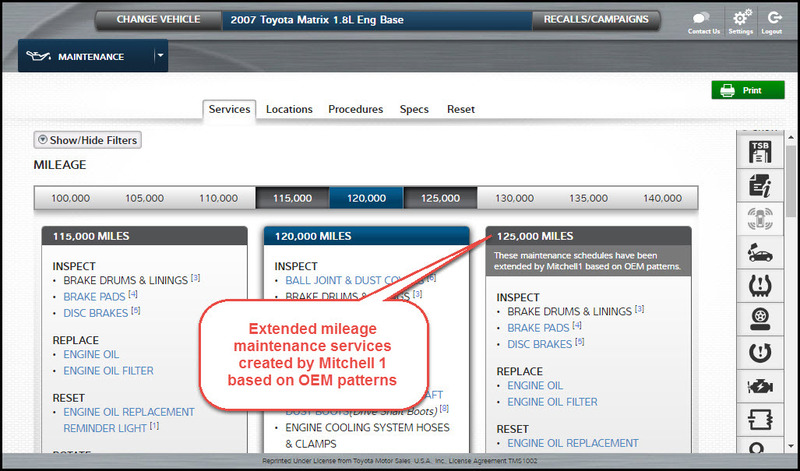 The extended maintenance information is created by Mitchell 1 and derived based on the OEM maintenance service patterns. Not only have we extended the information, but we have also filled information into the in-between intervals to ensure all maintenance operations follow the same patterns for the life of the vehicle. Prev:Mitchell 1 Wins Two PTEN People’s Choice Awards! Gary Hixson is a Sr. Market Manager at Mitchell 1, and is responsible for product and market management of the Repair Information product line. Most recently he managed the release of ProDemand™, the industry-leading repair, diagnostic and maintenance information system.